‘Can’t Get Out of Bed’ might sound like a comical title for a band’s debut single, but Hawaiian sister act Crimson Apple and their songs are no laughing matter. 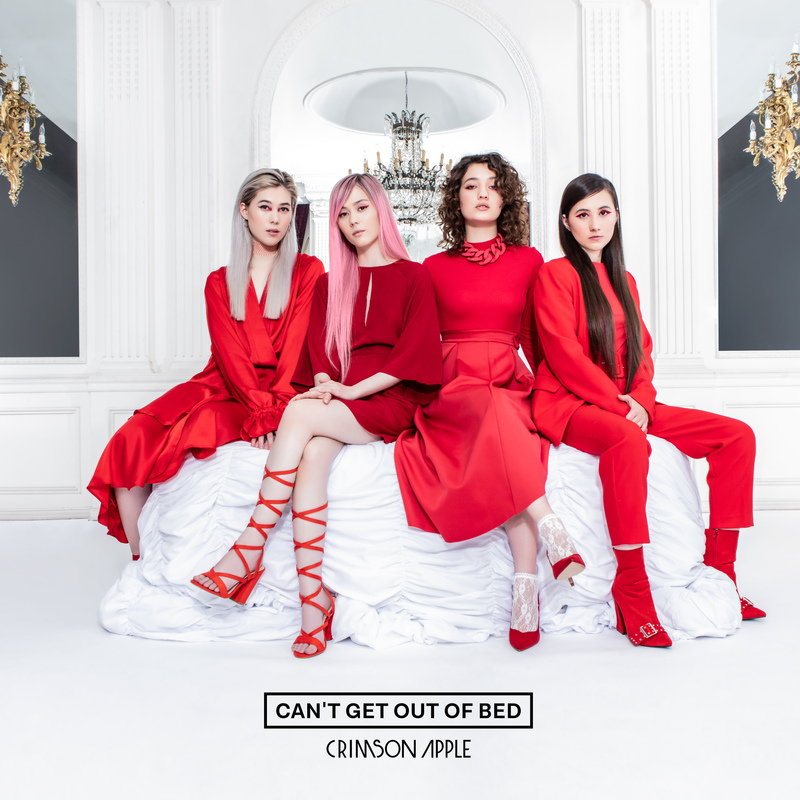 Colby, Carthi, Shelby and Faith Benson, the members of Crimson Apple, make a major debut with their single ‘Can’t Get Out of Bed’, an anthem for anybody who has battled depression and faced the crippling desire to just pull the duvet over your head and spend the day hiding from life. Sonically, however, there’s nothing to hide behind in ‘Can’t Get Out of Bed’, thanks to its powerful pop beat, gritty bass line and ready-for-the-radio synth drops. “I know this will pass, it has in the past, I get like this, I get like this” the girls determinedly declare during the song’s bridge, driving ‘Can’t Get Out of Bed’s message of dealing with depression straight to the core. 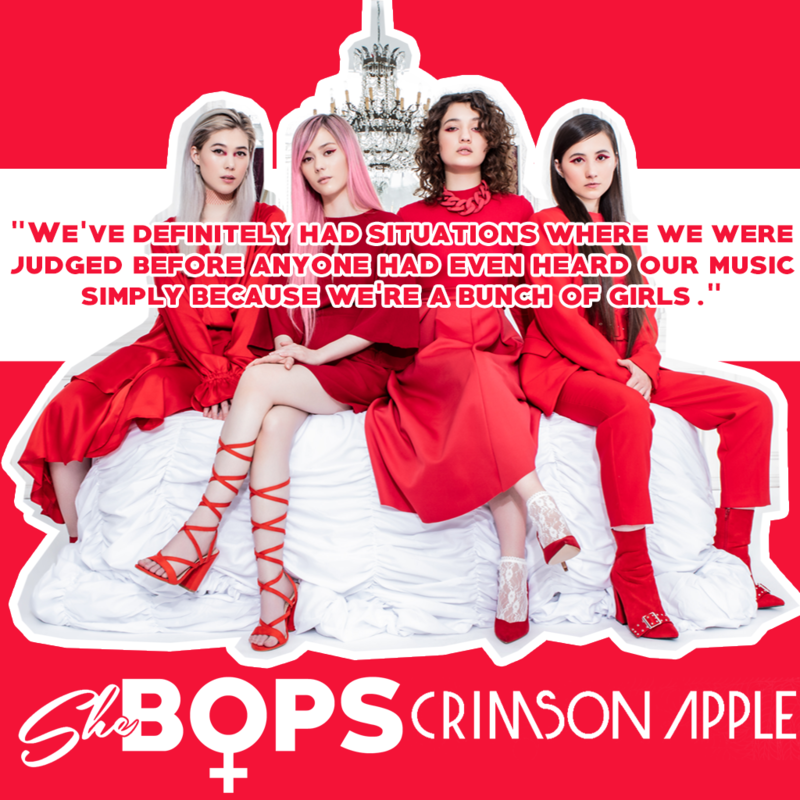 After their conception in 2012, Crimson Apple put in that werk by constantly performing and honing their craft, leading to the band sweeping Hawaii’s version of the Grammys with three nominations for their album Hello in 2015. It’s no surprise that the Benson sisters caught the attention of Japanese entertainment hitmakers AMUSE Group, the masterminds behind two of the world’s most iconic girl groups of all time: BABYMETAL and Perfume. With songs this good, Crimson Apple will surely reach the same levels of fame as their new label sisters. “We are musicians, and not just female musicians, and we want to be the best band we can be,” says Shelby. 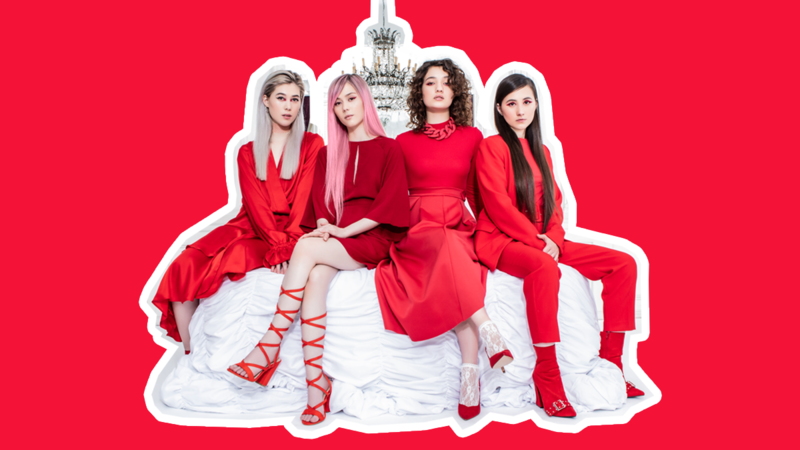 We managed to catch Crimson Apple before a month of shows as part of the High School Nation Fall Tour, where we spoke about the powerful meaning behind their catchy bop ‘Can’t Get Out of Bed’, growing up in beautiful Hawaii as well as a potential collab with label sisters Perfume and BABYMETAL. SheBOPS: You’ve been given a snail. You can’t give it away or sell it. What would you do with the snail? Crimson Apple: We’d name her Dusty, and she would be our baby. She would be the sole motivation for our success, so we can put leaves on the table and pay for her Ivy League snail college education. What’s your favorite ’80s jam? Where did the band name Crimson Apple come from? How does it represent your music and personalities? The name ”Crimson Apple” stems from a lyric in one of our favorite songs, called “Wine Red” by The Hush Sound. This was one of the first songs the band learned when we initially started playing together. Back then, the name represented the moment when the four of us first started making music together and realized this is what we’re meant to do. Since then, the name has grown with us. It’s become something that binds us together, not only as bandmates, but as siblings. You guys are all sisters, so what advice would you give to other siblings out there who want to work together? DON’T DO IT! Lol! Just kidding! Honestly, being in a sibling band has been such an amazing experience for us! It’s brought us so close together, and we’re all each other’s best friends. As far as advice, just make sure that there’s time outside of work to just be siblings. Don’t forget to rest and just have fun together. As a family, when you’re all really passionate and have one singular goal, it’s easy to let work blur with your family life. What is your message with new single ‘Can’t Get Out of Bed’? ‘Can’t Get Out of Bed’ is such a common phrase that a lot of people can relate to. Most people can use this phrase casually, but for others it can have a deeper message. This song is about struggling with depression and trying to explain it to the people in your life who don’t understand it. There is a sort of stigma around depression that makes it hard for people to talk about, on both ends of the conversation. This song was inspired by our lead singer’s personal experience with this issue. Does your Hawaii upbringing influence your artistry at all? Growing up in Hawaii definitely influenced our artistry in many different ways. The Hawaii music scene was an incredibly nurturing place for us. As young musicians, it allowed us to hone our craft alongside other local musicians, whom we can only describe as our musical family. Hawaii has a unique fusion of cultures, which has also played a part in our growth as musicians. Japanese culture is prevalent where we grew up, and that along with our Japanese heritage, lead us to becoming influenced by Japanese entertainment at a young age. How did you guys start working with Amuse Group? After moving to California, Amuse discovered us through our YouTube channel, and decided to catch a few of our live performances. When they approached us, we actually already knew who Amuse Group was because we really looked up to and were inspired by their artists. After meeting with the Amuse team, the band felt really excited about the prospect of working with such a great company. What would a collaboration between you and fellow Amuse Group acts Perfume and BABYMETAL sound like? If we ever had the opportunity to collaborate with Perfume and BABYMETAL, it would be a glorious female powered fusion of Japanese and American sounds in one epic, catchy song! With our music, our goal has always been to find a balance between both our live sound and our electronic music tastes. We’ve always been suckers for 80s synth bass and pop drum production. Our bassist creates really unique melodic bass lines that we love to highlight in our music. We also love to incorporate ambient guitars with a lot of movement and catchy picking guitar lines. With our drum production, we love the precision and power behind our drummer, who loves to use a fusion of both her live sound and her drum production skills. We also love sampling our lead singer’s voice, and manipulating it to create cool ambient sounds. All of the above! Plus Lynn Gunn, Anika Nilles, Miyoko Nakamura (345), and BLACKPINK (they fierce), just to name a few. As a band, we’ve definitely been jamming out to Billie Eilish, bülow, (G)I-DLE, Alina Baraz, Ariana Grande and Demi Lovato a lot lately. How do you feel about the representation of female artists in Hawaii? From our experience, there are a lot of respected and celebrated female artists in Hawaii. Although the music scene in Hawaii is smaller, we always felt like we were surrounded by female musicians. In general, the Hawaiian music scene seems to be very nurturing and loving to all musicians, regardless of their gender. While there are a lot of strong, amazing women out there seriously rocking the music world, there still seems to be a bit of a stereotype or box surrounding female musicians. We’ve definitely had situations where we were judged before anyone had even heard our music simply because we’re a bunch of “girls”. Although this has been a struggle for us, it’s only made us work that much harder to be taken seriously. Hopefully with the continual rise of strong female musicians, we can work to change this mindset within the industry. What do you think a band or musician needs to have in order to hit the big time? There are so many different artists with so many different success stories, it’s hard to say exactly what an individual should have in order to hit the big time. However, if you look at the traits a lot of these successful artists share, you’ll find that having focus, intense passion, a strong work ethic, and a strong identity goes a long way. What’s left to come from Crimson Apple this year? We’ll be going on a month-long tour of the east coast with the High School Nation Tour! We’ll also be releasing our very first music video for our brand new single, ‘Can’t Get Out of Bed’! For more updates, be sure to check us out on our website, and be sure to follow us on Instagram, YouTube, Facebook, and Twitter!